“Tares Among the Wheat” will likely challenge what most scholars believe about Bible history, and the origins of the current wave of new translations that have flooded churches around the world. In the 19th century, a revolution in biblical scholarship was prompted by the publication of a never-before-seen manuscript called Codex Sinaiticus. The work was allegedly “discovered” by a German scholar named Constantine von Tischendorf, who declared this to be the oldest Bible ever found. Tischendorf said he found the work in a rubbish basket at a Greek Orthodox monastery in Egypt. While many in the academic world did not fully believe his story, they were willing to accept his claims about the antiquity of the codex. But shortly after his discovery was published, a renowned Greek paleographer named Constantine Simonides came forward and declared that the manuscript was no ancient text at all, but had been created by him in 1840. The controversy surrounding these events is, perhaps, the most incredible untold chapter in Bible history. It involves Jesuits, the Pope, a high-minded German, a committee of Anglo Romanists, and a mysterious Greek patriot. It is a story that (while quite true and well documented) a vast majority of modern academics know nothing about. Yet the subject matter dramatically impacts the world of biblical scholarship, even to this present hour. Most of what today’s scholars believe about MS. evidence is based on the events of this era, and the footnotes in your Bible are the proof of it. To order a copy of Chris Pinto’s DVD, click on the link entitled “Tares Among the Wheat“. To learn about the history of the Bible, during the last 2,ooo years, watch the video below entitled “Lamp in the Dark – The Untold History of the Bible. The major claims, made by Westcott and Hort, is that Codex Sinaiticus is older, and more reliable, because the text is missing passages of Scripture that cannot be found in manuscripts written before the 4th century. However, this is not true. For examples of how various disputed passages of Scripture can, in fact, be found quoted in the writings of Church elders before the 4th century, see the list of disputed passages below. 160 to 240 AD – Tertullian, in “Treatise of the Soul”, he uses Mark 16:9 as a basis for teaching on demon possession, on page 372, 1st paragraph of Google Books. Saint Pacian 310–391 AD quotes John 8:11 in his 3rd epistle entitled “AGAINST THE TREATISE OF THE NOVATIANS” section 39. Accounts of John 7:53 through John 8:11 have been made by church elders as early as the 4th, 3rd, and even the 2nd century. Also, these quotes have been noted on pages 8 and 9 of “The Pericope de Adultera: Jo 7:53 – 8:11 (Jesus and the Adulteress)“. Scripture must be contended for, because if God’s word is not completely true, correct, and preserved throughout the church age, then we cannot contend for the faith against heresy. Also, neglecting to obey God’s command to contend for the faith, will cause heresy to eat away at the church like a cancer. To download a copy of the Textus Receptus, click on the link entitled “Download – Interlinear Scripture“. 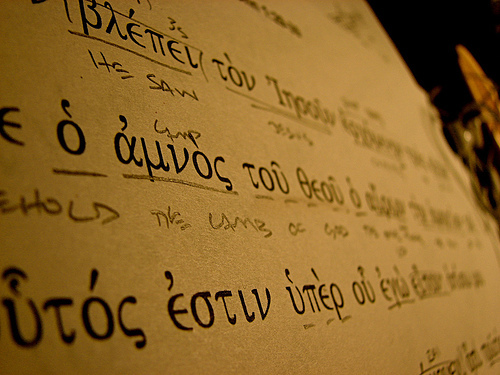 To read the Textus Receptus online, click on the link entitled “Hebrew Interlinear Bible(OT)” & “Greek Interlinear Bible (NT)“.